I really enjoy looking at your realistic paintings. 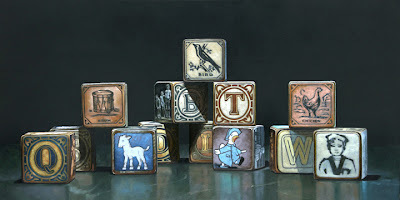 Did you use actual antique blocks as reference for this painting? Very nice! I am fan of painting but I am waiting for my graduation then 'll start. AWSOME!!! I just love all these! as being the part of Painting Virginia i can feel your passion behind these great piece of art. Keep up doing the hard work. I really appreciate your hard work and would like to see some more stuff like this one in the near future.